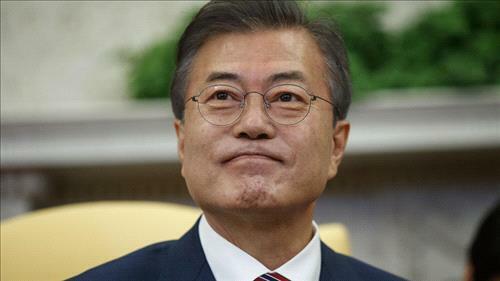 AMMONNEWS - South Korean President Moon Jae-in said on Monday he hopes a “major agreement” is reached on the denuclearization of the Korean Peninsula during an upcoming meeting between US President Donald Trump and North Korea’s Kim Jong Un. In a chief aides meeting held at the presidential office, Moon said he hopes Trump and Kim “generously” consider each other’s demands and meet the people’s wish for a new era for the Korean Peninsula. “I hope that a major agreement on ending hostile relations (between US and North Korea) and the denuclearization of the Korean Peninsula is reached through this time's summit,” Moon said. Moon has no current plans to join President Donald Trump and North Korean leader Kim Jong Un at the end of their summit Tuesday in Singapore. Trump and Kim will hold a historic summit at Capella Hotel in Singapore at 9 a.m. local time Tuesday (0100 GMT). Both Kim and Trump arrived in Singapore on Sunday.